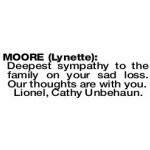 The Cremation Service to honour the life of Lynette Moore formerly of Aubin Grove will be held at FREMANTLE Cemetery on MONDAY (1.4.2019) in the West Chapel at 10.00am. A splash of yellow to be worn. 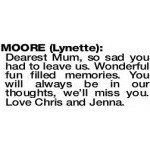 MOORE LYNETTE Dearest Mum, so sad you had to leave us. Wonderful fun filled memories. You will always be in our thoughts, we'll miss you. Love Chris and Jenna. 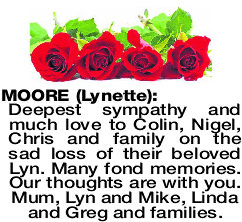 Deepest sympathy and much love to Colin, Nigel, Chris and family on the sad loss of their beloved Lyn. Many fond memories. Our thoughts are with you. 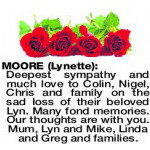 Mum, Lyn and Mike, Linda and Greg and families. Deepest sympathy to the family on your sad loss. Our thoughts are with you.